A 70 year-old woman with chronic kidney disease, on IV antibiotics for osteomyelitis. 4 mm sagittal FSE (3 echoes) T1- and (15 echoes) T2-weighted images are presented, acquired at 1.5 T on a Siemens Avanto MR system. Sequence parameters were TR/ TE = 665/7.9 and 3130/98, respectively. Scan times were 3:35 and 3:32 min:sec. At L2-3 there is loss of disk space height (best seen on the T2-weighted scan). 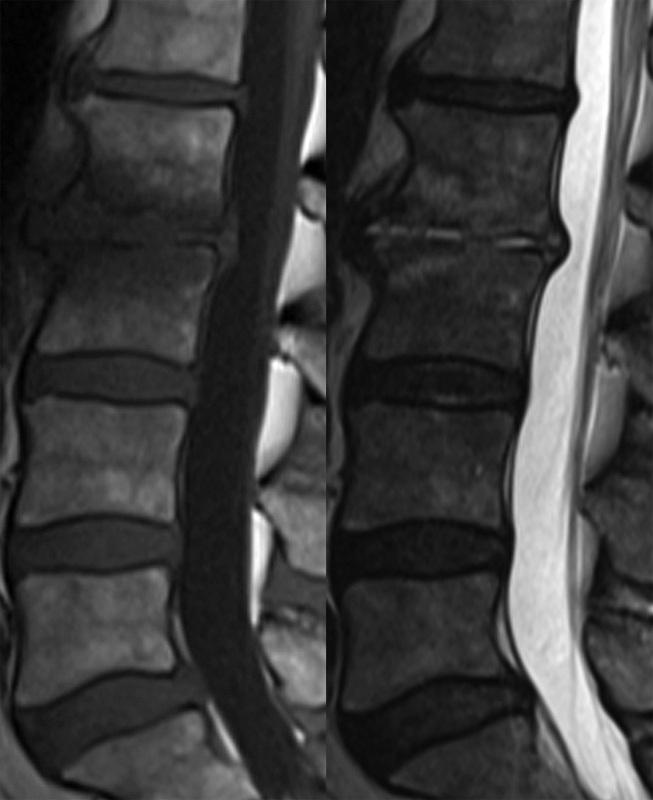 There is abnormal high signal intensity, consistent with fluid (and a resolving disk space infection), on T2-weighted images within the disc. On T1-weighted images there is abnormal low signal intensity involving the inferior endplate of L2 and the superior endplate of L3. There is marked irregularity of the inferior endplate of L2. 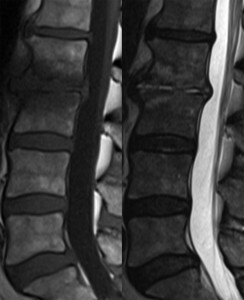 A small amount of abnormal prevertebral soft tissue is present, best seen on the T1-weighted scan. The findings are all mild in degree, due to partial treatment. It should be noted that the findings on MR in disk space infection (specifically the return to normal appearance), during treatment, lag behind the clinical course. Intravenous contrast was not administered, given the known diagnosis and the patient’s chronic renal failure. However, if clinically indicted, macrocyclic gadolinium chelates can be administered in renal failure (including dialysis patients, stage 5 chronic kidney disease).